How did men and women secure their letters before the introduction of gummed envelopes? Why should the materiality of letters as folded packets interest scholars and conservators as much as their contents? Jana Dambrogio (Thomas F. Peterson (1957) Conservator at Massachusetts Institute of Technology) and Daniel Starza Smith (British Academy postdoctoral research fellow, Lincoln College) led a workshop to explore these and related questions through a series of hands-on case studies. When we send letters today, the envelope acts as a security, protecting the content from prying eyes. But envelopes as we think of them now were not invented until the mid-nineteenth century. Prior to this letters were secured by folding and various combinations of sealing, tying, cutting, and sewing, making the letter its own security device. 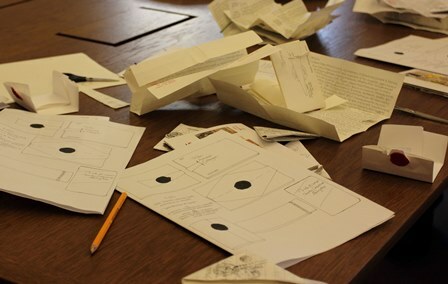 ‘Letterlocking’, as Jana Dambrogio calls it, is a social and textual practice of document security that stretches back thousands of years, but the workshop focused particularly on techniques dating from the late sixteenth to the mid-twentieth century. Participants were able to open pre-sealed examples, and, throughout the workshop, learn to fold and lock their own. We began by opening a folded packet, sealed with a strip of paper and wax seal. Upon opening, a number of slits were visible, running vertically down each side of the paper; a triangular section of paper was also missing from the lower, right-hand corner of the unfolded letter. Many early modern letters currently survive in this state today, and it is only by thinking of letters as folded and sealed packets, rather than simply flattened objects, that we can begin to piece together why these material signs – vertical or horizontal slits, and missing triangular pieces – matter. In this example, the triangular piece of paper has been cut from the end of the letter and used as a sealing device to authenticate the packet. Anyone receiving this packet would know if its contents had already been read, because both wax seal and paper strip would be broken. It would take someone with access to an identical seal and paper-stock to replicate this security measure once opening it. This format of letterlocking is, therefore, a more secure method than the ‘tuck and seal’ method (also demonstrated in the workshop) in which one side of the packet is tucked into the other prior to sealing. We then looked at a series of case studies of alternative letterlocking formats, each of which demonstrated the importance of bringing an analysis of a letter’s material form to bear on understanding the circumstances of its production, exchange, and reception. Wax is by no means a necessary part of letterlocking, as we learned by studying correspondence sent from the front line by a Russian soldier in the Second World War. This soldier secured his letter (into a triangular format) with the expectation that it would be opened and read by army censors, who would examine the post sent by troops to safeguard against the risk of military intelligence coming into the wrong hands. Similarly, a letter sent by Marie Antoinette to Cardinal Ignazio Boncompagni Ludovisi showed the importance of being able to open, but re-secure the letter with a removable paper lock and elaborate papered-seal. Other examples included a format often used by Robert Devereux, Earl of Essex in his correspondence with Elizabeth I: the letter is pleated, folded into a small packet and a length of thread is wound around the ends of the folded letter, and warm sealing wax is placed over the thread on one (and often both) of the exposed panels and impressed with a signet. Folding a letter in this way produces a thin rectangular packet easily concealed in the hand or sleeve, and choosing this letter format might then serve to communicate intimacy or a wish for intimacy between letter-writer and recipient, in addition to the written contents of the letter. John Donne’s letters were arguably the ‘show-stoppers’ of the workshop, if only for his spectacular seals: a sheaf of snakes, and Christ crucified on an anchor. 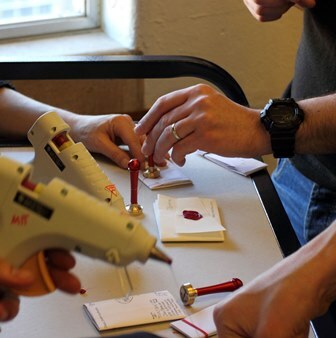 Participants sealed their own versions of the letter formats demonstrated in the workshop using replicas of Donne’s own sealing devices that Dambrogio and Smith had specially made. Donne used many of the formats explored in the workshop, but perhaps unsurprisingly also took care to make more extravagant paper locks. The session ended with the chance to apply this knowledge to actual examples in the Bodleian’s Special Collections. We were able to materially ‘read’ surviving autograph Donne letters, besides other examples of letterlocking in some of the Bodleian’s manuscript letter collections. This final stage of the session served to illustrate an important point: letterlocking is useful for both researchers and conservators. After working through the examples, we could appreciate that letters were neither ‘flat’ objects (they only seem to be once they are bound into a composite volume), and that they conveyed a number of social signs through their material features. If scholars are repeatedly called upon to recognize the importance of the material text, letters are a useful place to begin exploring the connections between material form, content, and meaning.